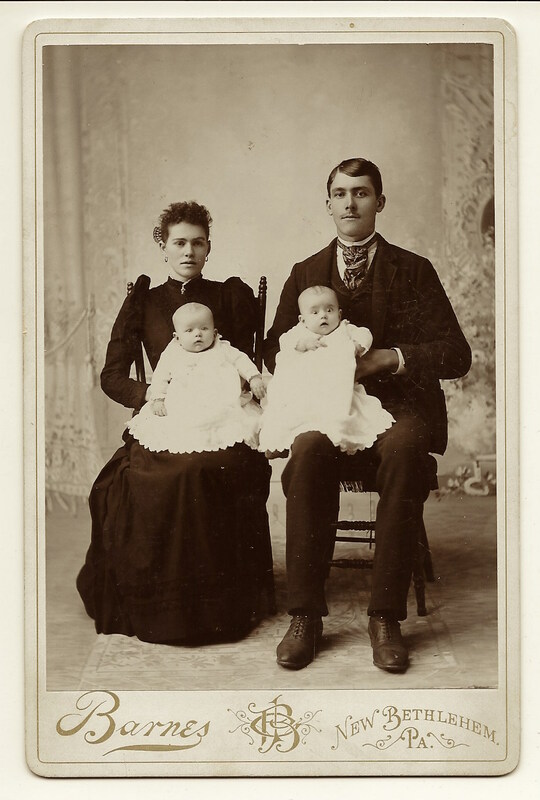 This family portrait carte de visite includes a set of parents and their three young sons. Each member of this clan appears very serious as they pose for this image. The family is wearing their fine clothing for their photograph which was taken by Max Schmidt of Neu-Weissensee, Germany. Mom is holding a book, most likely a bible. Each boy is wearing a hat and holding a toy. 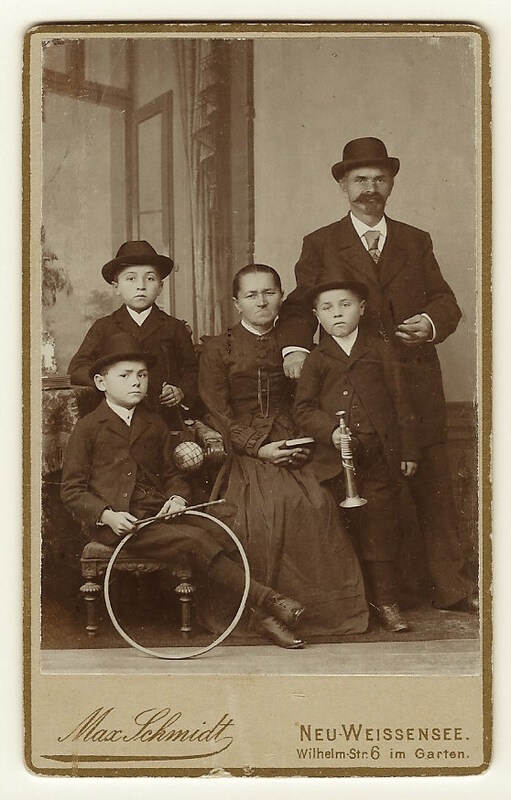 One boy is holding a horn, the second child has a ball toy, and and the third boy is holding a trundling hoop. Hoop rolling or hoop trundling is a child’s game which has been documented as far back as Ancient Greece. In the game, the hoop is rolled along the ground, usually by an object held by the player. The player tries to keep the hoop upright for an extended period of time or performs tricks with the hoop. 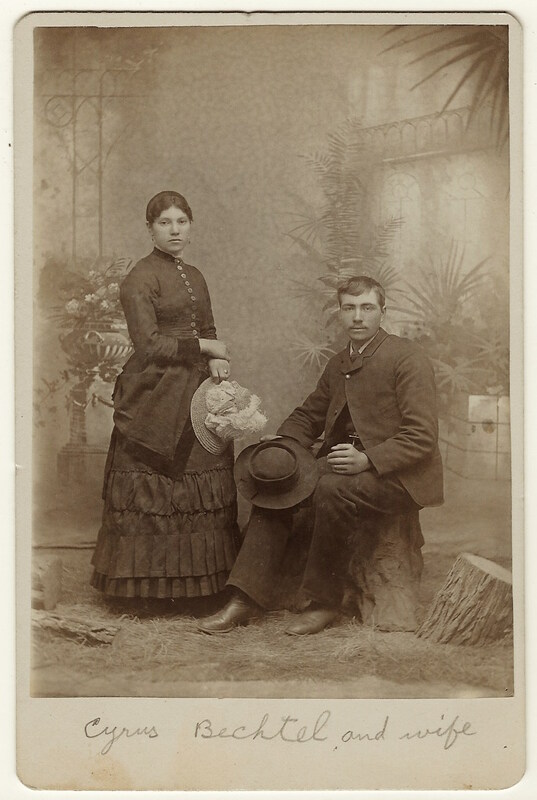 A young couple poses for their portrait at an unknown studio and locale. The pair are well dressed and holding their hats. The woman is wearing a ring and earrings. Their style of clothing provides a clue that they are likely being photographed somewhere in the western area of the United States sometime in the 1880’s or 1890’s. 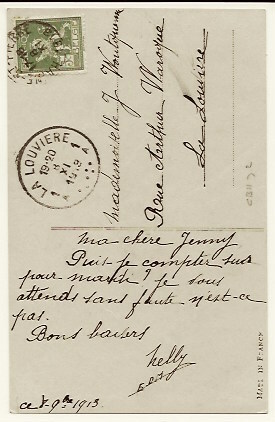 A pencilled inscription on the bottom front of the cabinet card names the couple as “Cyrus Bechtel and wife”. A beautiful border collie sits on a bench and cooperates wholeheartedly with a photographer. The bright eyed dog displays an “eager to please” expression. 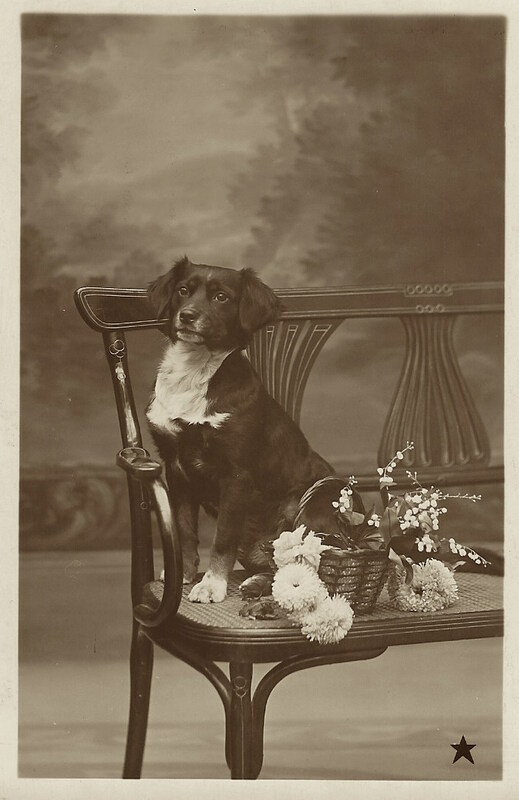 A basket of flowers sits beside the adorable pooch. 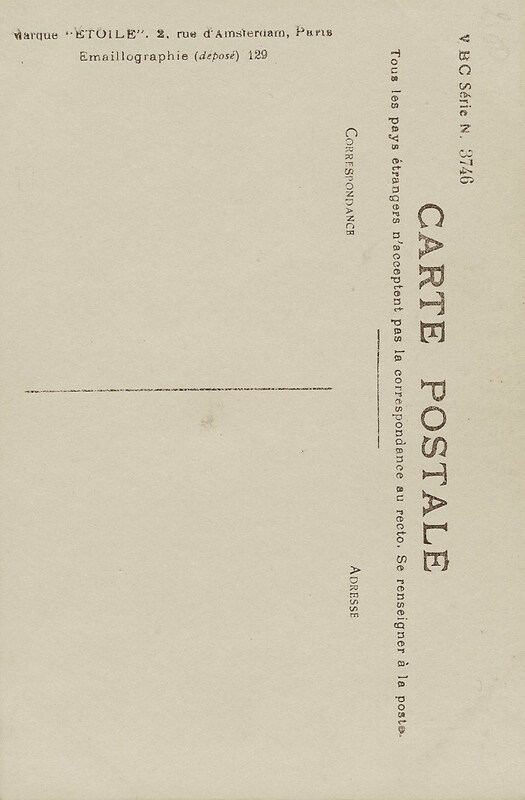 This vintage real photo postcard was produced by Marque “Etoile” (Star Brand) of Paris, France. 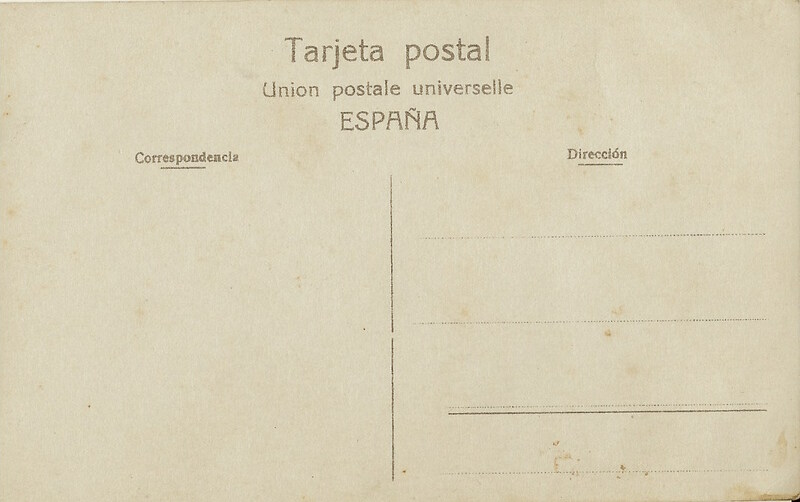 The postcard is marked V B C Series (N. 3746). 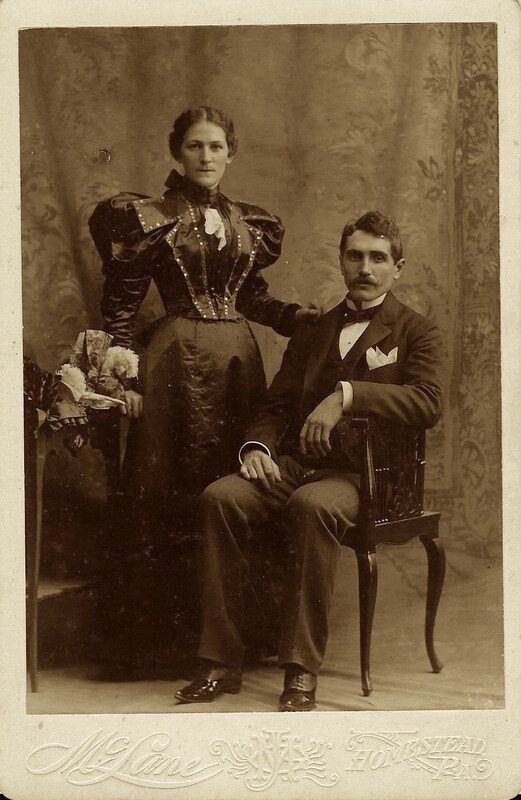 This cabinet card portrait features a lovely couple photographed by the McLane studio in Homestead, Pennsylvania. The couple are attractively dressed and well groomed. The woman has a lovely figure that is assisted by a corset. She is standing next to a bouquet of flowers. The gentleman has a nice mustache which curls at it’s ends. Note his shined shoes. Perhaps this is the couple’s wedding portrait. The photographer, John G. McLane (1849-?) apparently moved around a lot. He can be found in directories working as a photographer in Bradford (at least 1885-1887), Titusville (at least 1893-1895) and Pittsburg (at least 1900-1902). All of these cities are in Pennsylvania. One of McLane’s photographs can be found in the book, “Victorian Fashion in America (2013). McLane was a civil war veteran. He fought for three years as a member of the 142nd Pennsylvania Infantry. He entered the unit as a drummer. The last years of his life were spent at a home for disabled veterans. He is buried in Grove Hill Cemetery (Oil City, Pennsylvania). 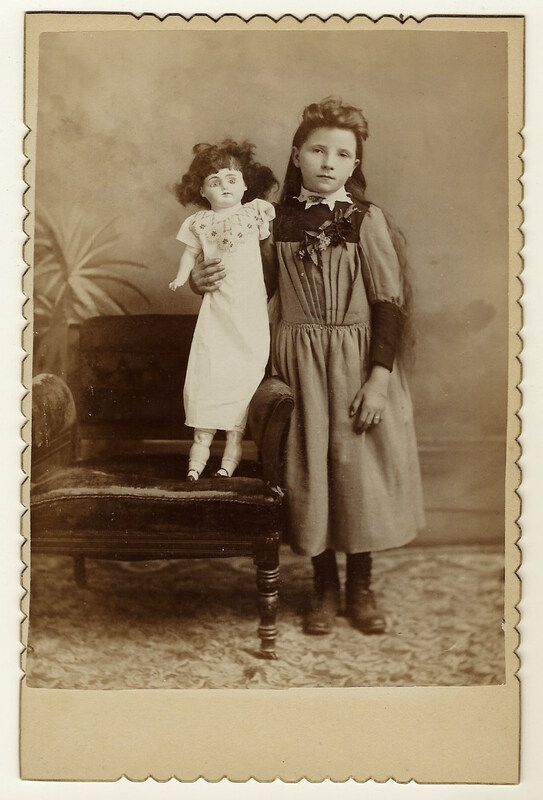 This cabinet card portrait features a cute little girl and her large doll. The child is well dressed and doesn’t seem to be particularly pleased to be posing for this photograph. Apparently she did not have the inclination to brush the doll’s hair to make her more presentable for the date with the photographer. The photograph has scalloped edges. 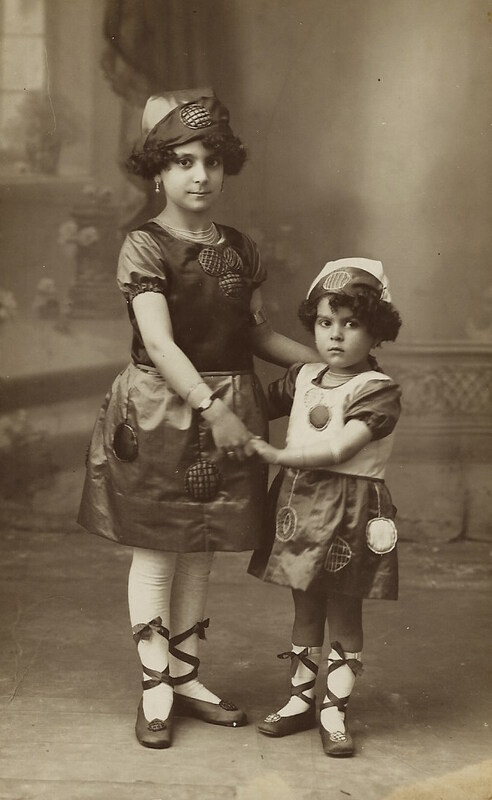 The child and the name of the photography studio are unidentified. The previous owner of this cabinet card asserted that the doll is of German origin but I have no confirmation. 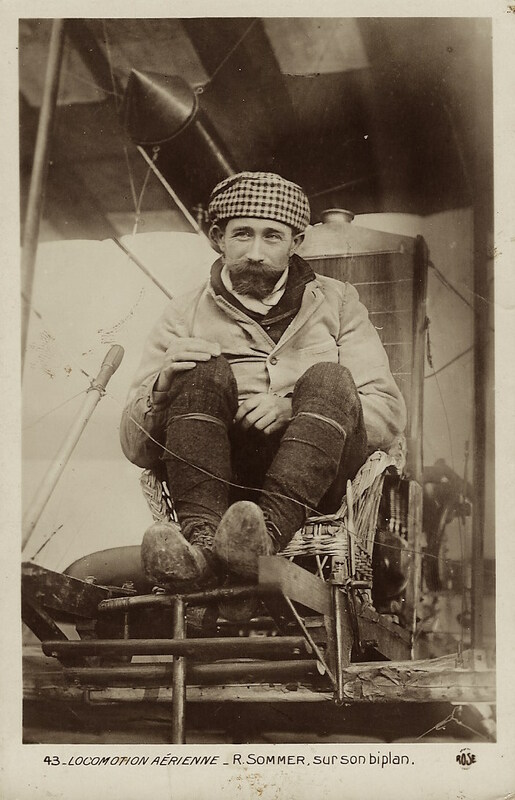 This vintage real photo postcard features a portrait of French aviator Roger Somner (1877-1965) sitting in the pilot seat of his 1910 biplane. Somner was an aviation pioneer. The Washington Herald (1909) reported that he broke a world record in a Farman Biplane by flying one hour and fifty minutes at the height of 80 feet. This was a record due to the length of time logged in the air. The Oregon News (1909) described an international aviation contest involving at least five nations competing for about 401,000 dollars worth of prizes. Somner was representing France while the American competitor was Glenn Curtiss (another celebrated aviation pioneer). The Lewiston Evening Journal (1910) reported that Somner ad established a new world record by piloting a plane with three passengers for a total of five minutes. Somner was clearly a brave man. 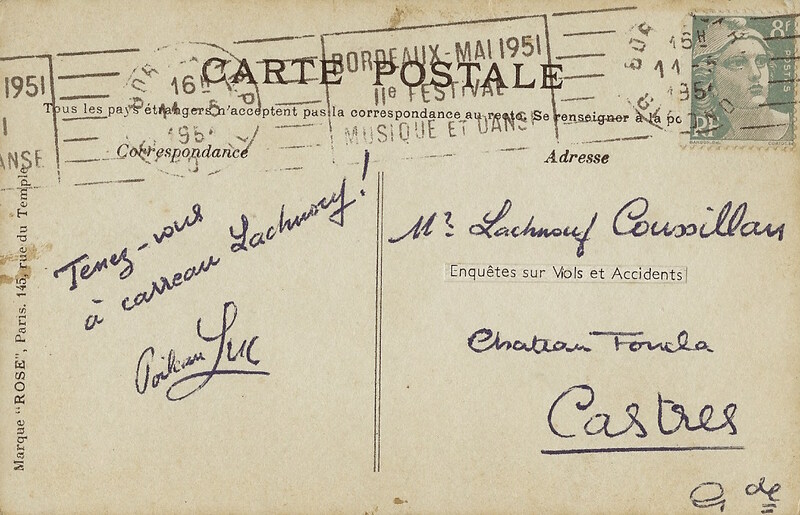 This vintage postcard has a postmark from the French city of Bordeaux in 1951. 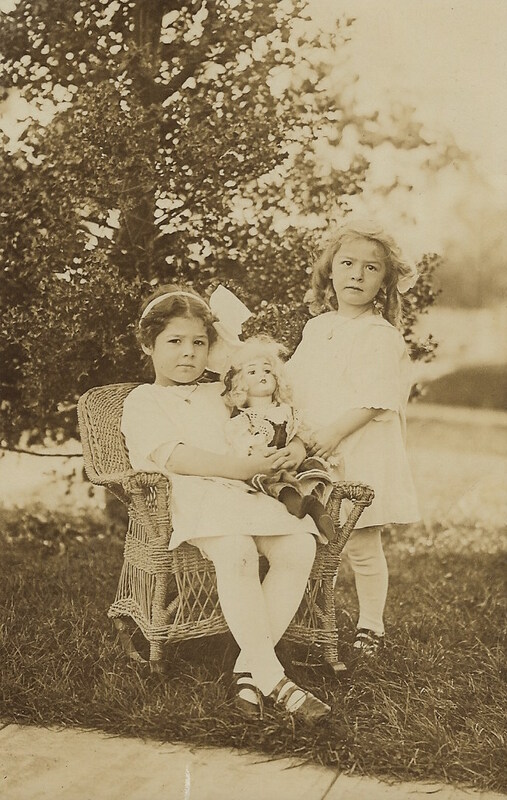 This vintage real photo postcard features a portrait of two young girls and a doll. One of the girls is sitting in a wicker chair with the doll on her lap but the second girl has her hand on the doll as if she is saying “this doll is mine too”. The photograph of the girls seems to have been taken outside or else the photographer has a great backdrop and is very good at setting a scene. 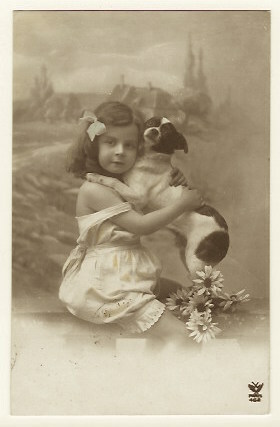 The girl’s names are written on the reverse of the postcard. “Dorothy and Margirie Warfield” are probably sisters. A quick genealogical search discovered that the 1910 US census lists sisters named Dorothy (age 3) and Marjory (infant) Wharfield (also spelled Warfield). The sisters and the rest of their family lived in Portland, Oregon. The girl’s parents were Arthur (age 29) and Gertrude (age 28). Arthur worked as a merchant (furniture store). It is very possible that the girls in the census are the same as the girls in the photograph. 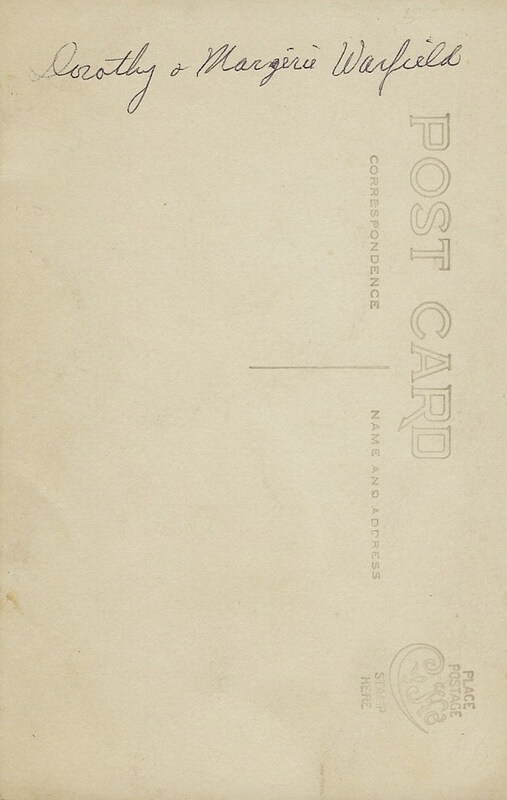 This postcard has a CYKO stamp box which indicates that it was produced sometime between 1904 and the 1920’s.